International concepts come with some good and bad! When international chains like Walmart step foot in India, there are bound to be arguments for both sides of the debates, but when Indian retail chains take up the concept from abroad and implement it in India, I believe the bad can be limited, not eliminated, but limited. 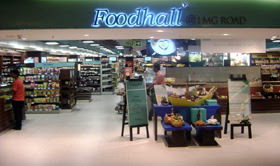 So when I paid a visit to Food Hall at 1 MG Road Mall, Bangalore, I thought the whole thing was brilliant. As soon as you enter, you have a cooking station and the chef invites you to 'Bring out the Chef in you'. With lots of raw materials and a chef to help, you could make a nice meal for yourself. Or for the less adventurous, you can make your own salad or sandwich at the next counter or you could pick up a ready made sandwich or salad, but they are more expensive. I had a simple non veg sandwich and I chose the focaccia bread with two meats and two veggies for Rs 150 and it was quite filling and tasty. The spice counter is excellent - the variety they have was quite extensive and the guy behind the counter was quite knowledgable (If someone know more than me, then they are knowledgable in that department from my POV, but of course, yours could be different)! 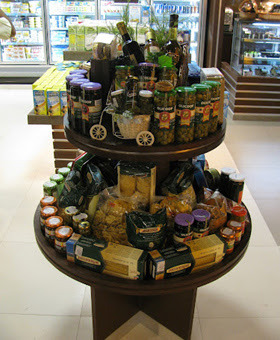 And then the usual packed supermarket stuff - just that the variety of international food stuff was quite extensive. You can even make your own cereal mix with a small variety of loose cereal. No fresh meat, but a superb range of cold cuts and frozen meat make up for it and does not make you feel bad to get the fresh meat from a local shop. 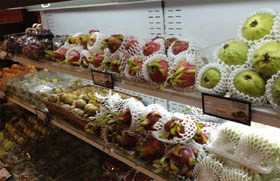 Vegetables and fruits made up another full counter. 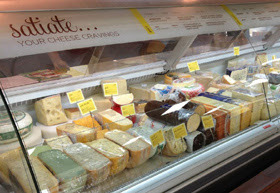 The cheese section was amazing and the best I have seen in India with a wide variety of both local and foreign cheeses and a smaller bread section with a variety of bread. And then there was a counter with cakes, brownies and muffins and a small area with about 5-6 tables for you to eat whatever you picked up, if you chose to eat it there and that is where I ate my sandwich. 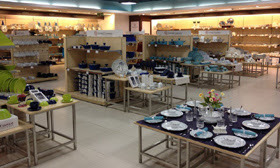 The second hall (connected by the space where you eat) had a range of home appliances and kitchen needs with some very expensive pizza plates and the likes! I loved it, it was some kind of an extended and posh Amma Nanna and I wish Food Hall decides to come to Chennai soon. I read one post which said that Food Hall was a complete failure in Delhi, but going by the crowd in Bangalore, I think they are doing OK!!! Photo Credit - Food Hall website.